With a regular crowd of 250,000 or more in attendance and some of the world's largest automobile manufacturers spending huge amounts of money hoping to win bragging rights, the 24 Hours of Le Mans is one of the biggest annual sports events in the world (even if much of North American media do their best to ignore it). The 80th running will be June 16 and 17, with Speed TV providing live coverage of all except 2 hours of the race, starting at 8:30 a.m. E.T. on Saturday morning a half hour before the start, ending Sunday morning at 9:30 a.m. E.T., a half hour after the race ends followed by the victory celebrations. 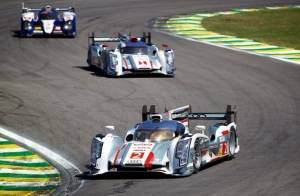 Speed TV will also have Toyota's "Road to Le Mans" on Friday night (repeated Saturday morning before the start of the race), and TSN will have Audi's "Truth in 24" tonight (Monday) at midnight (technically 12 a.m. E.T. Tuesday morning). A few years ago when I had Bell TV service, they promoted that one of their temporary channels would have the TV feed for the entire race. The Bell channel started showing the feed at 8:30 a.m., but then switched back to being a movie channel preview barker right as the race started at 9 a.m.
A few hours later, when SpeedTV's coverage temporarily stopped while they switched to something else like Nascar qualifying, I called Bell to ask what happened to the non-stop feed on their channel. They eventually put me through to a grumpy technician, who seemed annoyed and too lazy to care, and he insisted, "That was this morning. It ended. It's over now." After repeatedly attempting to politely explain to him that the 24 Hours of Le Mans does indeed last for 24 hours, and him absurdly arguing it didn't, he finally conceded that he would look into it and see what he could do. They put it back on the advertised channel -- but only for about another two hours before switching it back again to movie channel promos. As much fun as it might have been, I didn't call Bell again. Last edited by Donovan's Monkey; 09-16-2013 at 04:58 PM. Most of the 24 Hours of Le Mans will again be shown on Speed in 2013 starting tomorrow (Saturday) morning. But with this channel changing its name and programming format in the U.S. and the future availability of the Fox Sports 1 and 2 channels in Canada still unknown even if they continue carrying Le Mans, it may be the last time we get to see it on television. Patrick Dempsey of Grey's Anatomy fame will drive in the race, as another actor, Paul Newman did in the past (Steve McQueen wasn't in the actual Le Mans race for insurance reasons, just driving for movie scenes, but did race at the 12 Hours of Sebring). Last edited by Donovan's Monkey; 06-28-2013 at 10:11 PM. Even without Fox 1+2, we'll still hopefully be able to watch it online. Britain's Eurosport also has the broadcast rights for another 3 years and the Eurosport HD online feed that I'm watching right now has virtually no buffering at all (and looks like it's in at least high-quality 480p, or most likely even better than that . . . it's hard to be sure with night racing). The night racing isn't what I'd call must-see-TV, but the Eurosport announcers offer interesting comments and I also like the glow-in-the-dark number decals on the cars. Speed's online coverage also has two, live in-car (Corvette) camera views (varied HD quality) that I'm periodically watching, and they make the night racing seem even more dangerous. Speed also has free, online HD coverage for 2.5 hours (2pm-4pm and 7pm-7:30pm) when it's not on its television channel (due to Nascar coverage, or whatever) . . . It also looks fine (although I'm currently streaming the Nascar race, Speed Feeds and Eurosport HD feed which does reduce the quality and smoothness of the Speed feeds). I'm a bandwidth hog today! yet will not be shown at all on Speed in Canada, at least according to any listings I've checked. Hopefully later we will at least get to see the one-hour high-lights package, and presumably we will be able to see it live on fiawec.com, since I was able to watch some of the races earlier this year from Silverstone (England) and Spa (Belgium) on that site. Last edited by Donovan's Monkey; 08-18-2016 at 01:32 PM. Zap2it.com listings are showing that the Speed channel seen in Canada (but no longer carried by Rogers and Bell) will be showing most of the 2014 24 Hours of Le Mans on Sat.-Sun. June 14-15. As shown in the listings at the moment (sometimes they get changed) the coverage begins at 8:30 a.m. E.T. Saturday morning, presumably 30 minutes before the start of the race. At 5 p.m. E.T., other programming takes over Speed for six hours, roughly corresponding to the night time at Le Mans, when there also happens to be a Nascar Truck Series race in the U.S. The Speed coverage resumes at 11 p.m. E.T., possibly an approximate time depending on when the truck race ends, and continues to 9:30 a.m. on Sunday morning, a half hour after the race ends. Fox Sports 1 and 2 are showing the entire race between them in the U.S., except for the 90 minutes from 5 to 6:30pm, though also with the whole thing on Fox Sports Go app. Last edited by Donovan's Monkey; 06-23-2014 at 03:51 PM. From the TV listings I've seen for June 13-14, the Fox Sports Racing (formerly Speed) channel will be showing the 2015 edition of the 24 Hours of Le Mans to the small percentage of Canadians who still get the channel, but just not quite as much of it, and more disappointingly, not the start of the race. The problem is that Fox Sports has two channels in the U.S. (Fox Sports 1 and 2), but only the single channel in Canada that shows only motorsports (well, not really since it now also has some skateboarding, horse racing, etc.). Usually that's not a problem, but it presents a conflict on the rare occasions when both FS1 and 2 have live racing coverage at the same time and only one can be shown simultaneously on the lone Canadian channel. Fox is again promoting that all of its Le Mans coverage will be available (in the U.S.) on their Fox Sports Go App, with much of it (about 11 hours of the actual race, not counting pre and post) also on FS1 and FS2. But when the race begins on Saturday morning as shown on FS2 in the U.S., FSR in Canada will be showing coverage of Nascar practice and qualifying from Michigan (assuming it's not raining there), and won't start showing Le Mans until 1 p.m. EDT, four hours after it starts. Nascar Truck racing will again take over FSR through the evening, before it returns to showing Le Mans through to the end on Sunday morning (EDT). Edit: Strangely, the FSR coverage for Canada beginning four hours into the race at 1 pm EDT does not coincide with anything on FS1 and FS2. I'm not sure if FSR will be showing the start of the race delayed by 4 or 4 and a half hours, or live coverage starting at the four hour mark simulcast only with the Fox Sports Go App in the U.S.
OR -- you could just pay ten Euros to watch the whole Le Mans race and qualifying sessions on fiawec.com, or 30 Euros for all of the races and qualifying during the entire 2015 FIA WEC season, although you've now already missed the first two races of the year. Another Edit: FSR started at 1 pm EDT, 4 hours into the race. In watching some of it today (June 13, 2015), in addition to the repetitive FSR promos during what are supposed to be the commercial breaks, occasionally some promos for Canadian channels are inserted, bizarrely including one for the 2014 FIFA World Cup on CBC from Brazil -- "kicks off June 12th on CBC". How does someone screw-up so badly that a promo that's an entire year out of date gets shown? Last edited by Donovan's Monkey; 06-13-2015 at 03:51 PM. -- it seems someone a few days ago at Ford Canada thought Canadians would somehow also be able to see it on Fox Sports Go, but I think they were probably misinformed. I clicked on it yesterday and saw "As an international user, you can only browse programs available to you", and it did then display some scheduled segments of the race as though they may be available this weekend, but today all of them have disappeared. The FIA WEC link in the above post from last year still works if you want to pay the 9.99 Euros, although the qualifying has already occurred this week. I think the guy at Ford might be correct. I compared the Fox Sports GO site as an American and as a Canadian and although you only see the golf for now, if you do a search (as a Canadian) for racing, you will see the 24 Hours show up, but only at 4:30pm, 6:30pm and 7:30pm blocks. What happened to the 2pm block? I didn't think it would be shown on Fox Sports Racing, so does that mean Canadians will miss that portion, or will it appear later? Or is Zap2It wrong? If you go to the Fox Sports GO site as an American, all the Fox content appears (FS1 and FS2), on the screen, and in the search results. That's why I think the Ford guy knows what he's talking about ... I just don't understand why the 2pm-4:30pm block doesn't appear in the Canadian search results, and perhaps you can't stream the stuff that's on FSR in Canada, unless perhaps you sign in, or just watch through your TV/IPTV hookup. EDIT: I see the Racing showing up on the website, so they'll let us watch golf, followed by the racing at 4:30pm. At least that's what it looks like (as of 6:22am EST). I didn't remember to check during the time when there was no FSR coverage, but I wasn't able to get anything to show up on Fox Sports Go from here in Canada at about 11 p.m. ET on Saturday night, even with the search for racing. It's interesting to hear the name of a certain French manufacturer during the web or TV broadcasts, as it always arises at some point with 24+ hours of air time to fill, even though they last entered the race in 2011. The Australian and British announcers inexplicably say it as "Purr-jhoe" , while the American ones seem to say "Pooh-Joe". I won't use an image for that second one, but it sounds like something a six year old kid would call another kid. Last edited by Donovan's Monkey; 06-20-2016 at 12:43 PM. I watched from Fox Sports Go just to see the Ford GT for a while (after 4:30pm), and then when I went back later in the evening it was gone, and searches for racing turned up nothing as a Canadian. So the Ford guy was only partially correct. Still, had you not linked the article, I would have never bothered to check. Not exactly much coverage for Canadians, but if it's mixed in with some piracy, at least we can follow along. The Fox Sports Racing channel will apparently be carrying all of the 2017 24 Hours of Le Mans live this weekend (June 17-18) from 8:30 a.m. E.T. Saturday to 9:30 a.m. on Sunday. FSR will uncharacteristically forego some live Nascar coverage, including a Truck Series race on Saturday night, waiting until Sunday morning to show a delayed airing of it after Le Mans has ended. U.S. viewers will be able to watch the whole race on Fox Sports GO, with FS1 and FS2 having most of it, missing only a three hour segment on Saturday from 10 a.m. to 1 p.m. when FS1 and 2 are showing soccer and Nascar practice and qualifying. Although not made public until recently, Fox Sports had already decided just before the 2017 race that it would be its last, and it was not going to renew its deal to continue carrying Le Mans and the rest of the FIA World Endurance Championship. The Discovery Velocity channel in the U.S. is thought to be a possibility for 2018, or maybe the only channel that would be interested. The Canadian version does not show racing, as it still operates under the licence it had when it was Discovery World, meaning Le Mans will likely not be seen on a TV channel in Canada. Last edited by Donovan's Monkey; 06-12-2018 at 07:36 AM. Discovery Velocity is Canada's new home for 24 HOURS OF LE MANS, live coverage beginning Saturday, June 16 at 8:30 a.m. ET ... through to the culmination of the race on Sunday June 17. Last edited by Donovan's Monkey; 06-12-2018 at 08:04 AM.